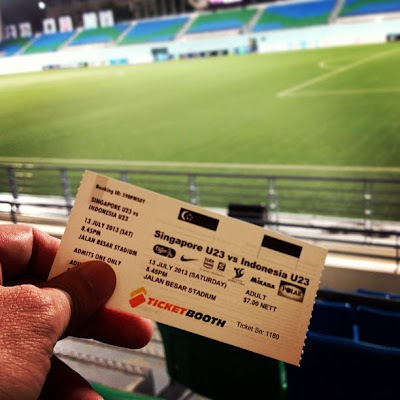 To be honest, we are still uncertain if the ticket to SEA Games for the national U23 football squad is being secured following their 1-0 win over their Indonesian counterparts. After all, the Singapore National Olympic Council (SNOC) had made it clear that in order to see the Cubs in action in Burma this December, certain criteria need to be met (i.e. : chalking up results against regional opponents to prove their worth). Coach V Sundramoorthy's boys continued to show their defensive superiority like they did in their recent MSL campaign (having fielded 10 Lions XII players in the starting eleven), the lack of goals upfront could prove to be their Achilles heel at the end of the day. The only goal of the evening came in the 10th minute from the spot after Shafiq Ghani made no mistake from the dot following a clever position by Faris Ramli at the edge of the box saw striker tussled his way into the box and earned the foul in the process. Several opportunities came along the way for the Cubs after that early lead, but only to have them blown away due to some poor touches coupled with lack of precision where it matters most, while counting themselves lucky on a few occasions that would see the visitors levelled the scores. For an example in the 54th minute, referee Sukhbir Singh brushed off an appeal for a penalty kick by the Indonesians for what it seems to be a legit foul by the hosts in their box, while having the agony of another chance headed off the line in the 71st minute by a Singapore defender. A last throw of the dice by the Singapore side by replacing Shafiq with striker Khairul Nizam in the 75th minute did not make things any better for the Cubs, as they concluded the day with a slim victory with much to be done in the goal scoring department. Speaking to the media on behalf on coach Sundram, Singapore U23 assistant coach K Balagumaran said:"This Indonesian team is one of the best I’ve seen at this level. Even though this is their second batch of players, they have shown that they have quality players who can switch positions at will. 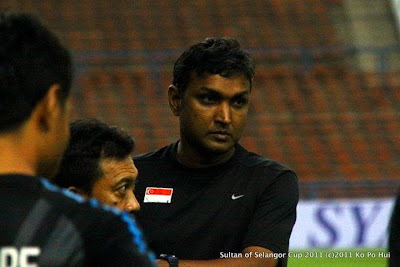 "Sundram’s philosophy for the boys is always to have a strong mentality and to stay tactically disciplined. The Indonesians gave a very good performance today but we managed to match them. I think we can do well in the SEA Games if we maintain this level of performance," added the former Gombak United coach.